Caught some video footage of a long train rolling through, pretty cool! Will post soon. Here is a pic. I never had any of that track on my runs(41 yrs CSXRR). We had one spot where it had been named coffee mountain account back in the days of passenger trains that use to run on that segment would go to fast into the curve and turn cups of coffee over so that's how it got its name. one of the many cool things about our area, looks like you were on the old road Ray? If you haven't done it, its a great road, gives you an up close and personal look at the trains. Pick it up on the west end of Tehachapi, although probably not fun for rigs over 30'. I unhooked the trailer in a big parking area by a cafe in Keene just off the main highway and drove the truck up a narrow curvy road to the overlook, maybe 3 miles. that's great, you got to see the real deal. Keene Cafe is a great little breakfast spot for us too. Somebody called the loop one of the seven engineering wonders of the world. Good luck on your trip north. 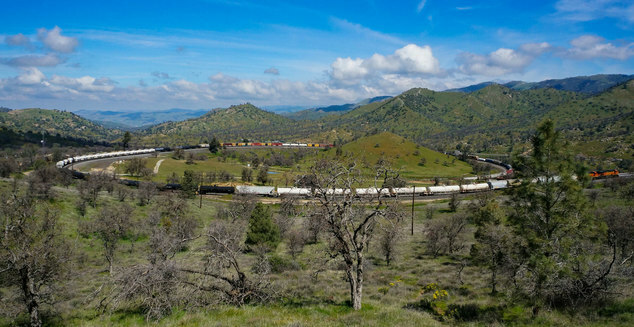 The Tehachapi Loop is a 0.73 miles (1.17 km) long spiral, or helix, on the Union Pacific Railroad Mojave Subdivision through Tehachapi Pass, of the Tehachapi Mountains in Kern County, south-central California. The line connects Bakersfield and the San Joaquin Valley to Mojave in the Mojave Desert. Rising at a steady two percent grade, the track gains 77 feet (23 m) in elevation in the Loop. Any train more than 4,000 feet (1,200 m) long passes over itself going around the loop. At the bottom of the loop, the track passes through Tunnel 9, the ninth tunnel built as the railroad worked from Bakersfield. I show via Google maps where the loop is located and where we parked the fifth wheel. Since the road in is narrow and curvy, I parked the trailer in the village Keen 3 miles away and drove in with just the truck. Lucky for us a long train soon showed up, and I got some video footage of it passing through the loop. So cool! That's pretty amazing!! Another reason our country is awesome.... ENGINEERING!!! We have come this way several times, but didn't know about the loop. Something fun to check out next time. Last week we made the drive up from the desert to Oregon and decided to go 395 all the way to Alturas. 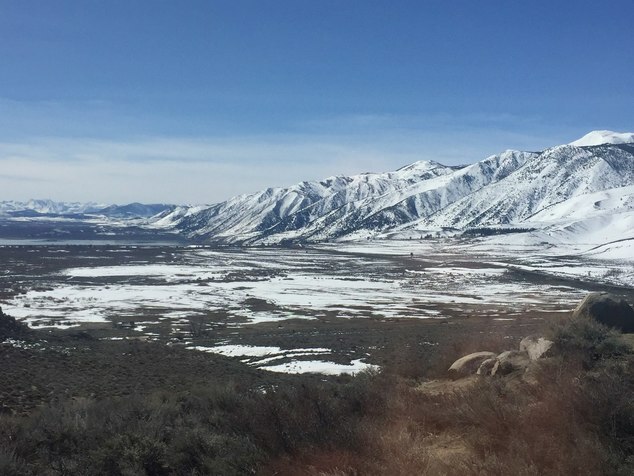 It was such a beautiful drive this time of year, with snow still in the Mountains! And the road was great, after Kramer Junction, and light traffic as well. Our new route, if weather permits. Been through there many times and didn’t know that existed. Thanks for sharing Ray!